Malaria is one of the very common causes of fever in the Indian subcontinent with significant morbidity and mortality. In endemic areas, malaria infection may manifest with a variety of systemic complications ranging from mild to the life-threatening condition including atypical presentations and sometimes a clinical dilemma. We herein report a case of 35-year-old male laborer with complaints of fever, headache, and altered consciousness whose presentation was as case of clinical meningitis, developed acute hepatitis, kidney injury, and necrotizing pancreatitis. Later on, he diagnosed to have mixed malaria infection and improved well to antimalarial drugs with supportive management. In malaria, acute necrotizing pancreatitis is a rare and potentially fatal complication. We also accomplish a systematic review of literature for reports of acute pancreatitis due to Plasmodium infection. This report highlights the occurrence of several rare complications and systematic review of literature for acute pancreatitis due to malaria. Malaria, transmitted by the bite of infected female Anopheles mosquito, occurs throughout most of the tropical regions of the world. The prevalence of two species Plasmodium falciparum and Plasmodium vivax is approximately equal in the Indian subcontinent. In endemic areas, malaria infection may manifest with a variety of systemic complications. The most frequent manifestations are jaundice, kidney failure, metabolic acidosis, anemia, hypoglycemia, cerebral malaria, and convulsive crisis. In view of unusual presentation, we describe here a patient with mixed malaria complicated with meningitis, hepatitis, renal failure, and necrotizing pancreatitis. With best of knowledge, only one case of acute hemorrhagic necrotizing pancreatitis due to malaria is found on PubMed and Google searching. However, there are only a few cases of acute pancreatitis in literature discussed later. A 35-year-old male laborer was admitted in medicine department with complaints of high-grade fever associated with chills and rigor for 6 days and headache for 3 days followed by altered consciousness for 1 day. On general examination, he was confused with Glasgow Coma Scale 13 (E4V4M5). There was no pallor, icterus, and lymphadenopathy but febrile (103.4°F). His pulse rate was 106/min normovolumic and regular, blood pressure was 130/80 mmHg, and respiratory rate was 20/min. Signs of meningeal irritation (neck rigidity, Kernig's and Brudzinski's sign) were present. Bilateral pupils were of normal size and reacting to light. All deep tendon reflexes were normal with bilateral planter extensor. Rest of systemic examinations were unremarkable except for generalized tenderness on abdominal examination. He had no history of trauma, seizure, headache, diabetes mellitus, hypertension, tuberculosis, drug abuse, alcoholism, or any similar episode in the past. His relevant investigations during the course of illness are summarized in [Table 1]. Viral markers (hepatitis A, B, C and HIV) were negative. Typhidot IgM, Dengue IgM, IgG, and NS1 antigen were also negative. Serology for herpes simplex was negative. 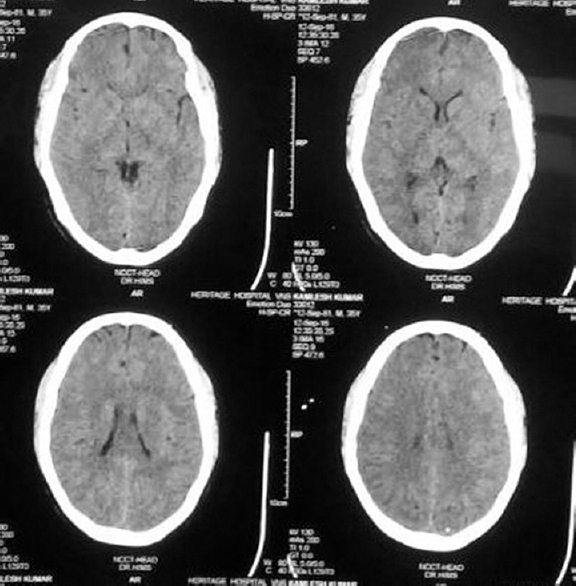 Computed tomography (CT) of the head showed calcified granuloma in the left occipital region [Figure 1]. Urine analysis was normal. Electrocardiography and chest X-ray were normal. His cerebrospinal fluid was clear with normal pressure, and analysis revealed total leukocytes <5 cells/cumm, protein 61 mg/dl, sugar 112 mg/dl, and the Adenosine deaminase 3.75 U/L. Thick and thin Leishman-stained peripheral blood smears revealed gametocytes of P. falciparum and schizont stage of P. vivax. Malaria parasite rapid immunochromatographic test for P. falciparum and P. vivax was also Positive. 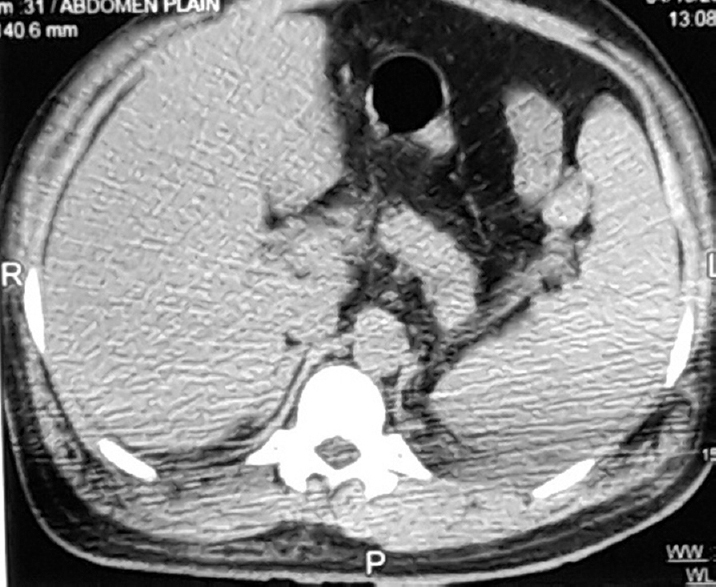 CT of the abdomen revealed necrotizing pancreatitis [Figure 2]. Based on the clinical presentations and blood investigations with positive blood smear for Plasmodium, a diagnosis of complicated mixed malaria (hepatic dysfunction, renal dysfunction, and acute necrotizing pancreatitis) was made. Other causes of pancreatitis were ruled out. The patient was kept nil per orally and treatment was initiated with intravenous ceftriaxone, artesunate, and clindamycin. Supporting therapy including analgesics and hydration was done accordingly. The patient was allowed to resume oral diet on the 4th day. He was started getting improvement day by day with resolution of complications [Table 1]. The patient got discharged in a clinically stable condition on the 14th day of admission with radical chemotherapy with primaquine. On his follow-up visit after 1 month, the patient was well to do. Malaria covers a wide range of clinical manifestations. Although most of the patients have only a relatively benign febrile illness, in severe malaria, 1–3 million deaths are estimated per year worldwide. The WHO estimates 100 million cases of malaria in the Southeast Asia Region and of which 70% cases are in India. 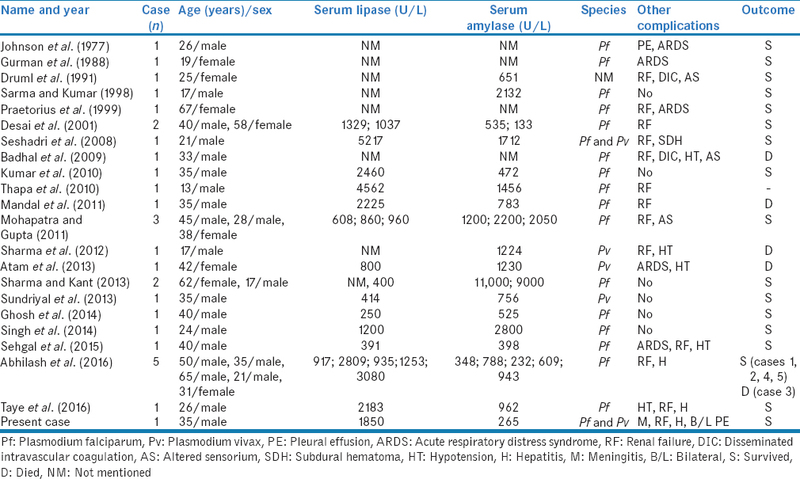 Multiorgan involvement is reported in both P. falciparum and P. vivax infections, but out of 4 species of Plasmodium causing malaria, P. falciparum contributes to 52% of the total malaria cases in India and responsible for the majority of morbidity and mortality, especially in rural population. Fortunately, the overall deaths have reduced since the launch of the National Malaria Control Program. Typically, malaria presents with fever and shivering, poor general condition, diarrhea, nausea, and vomiting. While during the course of the malignant malaria, it affects different organ systems of the body causing various complications such as cerebral malaria, coma, jaundice, severe anemia, renal failure, hypotension, disseminated intravascular coagulation, shock, and acute respiratory distress syndrome either alone or in combination. Apart from typical presentations of malaria, many unusual presentations are reported such as acute lung injury, meningitis, acute hepatitis including fulminant hepatic failure, and acute gastroenteritis. On systemic review for malarial pancreatitis, based on PubMed database and Google search using malaria (P. falciparum or P. vivax or Plasmodium malariae or Plasmodium ovale) pancreatitis and complication, we found 21 studies reporting 29 cases of pancreatitis due to malaria. As discussed, despite several strategies for malaria prevention and control, malaria remains a major public health problem in India causing fairly large morbidity and mortality. Hence, it is crucial to evaluate every case of malaria in detail, especially in the endemic region. Otherwise, patients with atypical presentation of malaria may be misdiagnosed and lead to increased morbidity and mortality. Malaria is very common in tropical countries and manifestations are like anything. Prognosis is good if specific treatment is started early. Therefore, patients of fever with atypical presentations need to examine for malaria parasites as mandatory investigation, especially in endemic country like India. Authors owe thanks to patient and his attendants for their cooperation and faith in us. Singh J, Dinkar A, Atam V, Atam I. An uncommon presentation of severe falciparum malaria: Acute pancreatitis. Int Res J Med Sci 2014;2:1-5. Reoyo Pascual JF, Cartón-Hernández C, Valero-Cerrato X, León-Miranda R, García Plata-Polo E, Martínez-Castro RM, et al. Acute hemorrhagic necrotizing pancreatitis in falciparum malaria. Rev Esp Enferm Dig 2016;108:285-7. Abhilash KP, Ahmed AS, Sathyendra S, Abraham OC. Acute pancreatitis due to malaria: A case report of five patients and review of literature. J Family Med Prim Care 2016;5:691-4. Badhal SB, Irshad M, Badhal S, Yadav K. Acute on chronic pancreatitis masking falciparum malaria: A case report. Glob J Health Sci 2009;1:123-5. Taye MK, Saloi DK, Choudhury B. Acute severe pancreatitis in falciparum malaria. Med J DY Patil Univ 2016;9:512-4. Atam V, Singh J, Agrawal K, Dinkar A, Atam I. A case report of valproate-induced acute pancreatitis. J Med Soc 2017;31:48-9. Singh J, Dinkar A, Gupta KK. Enteric fever complicated to acute pancreatitis; a case report. Int J Sci Res 2014;3:1017-8. Sehgal IS, Agarwal R, Behera D, Dhooria S. Malarial pancreatitis: Case report and systematic review of the literature. Indian J Crit Care Med 2015;19:743-6.